Murukku recipes comes to my mind only when Diwali is nearby. Thenkuzhal murukku is a must & should Diwali snack in my home.We prepare other murukku varieties too based on our interest. 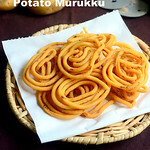 This year I have a big list of murukku recipes to try. 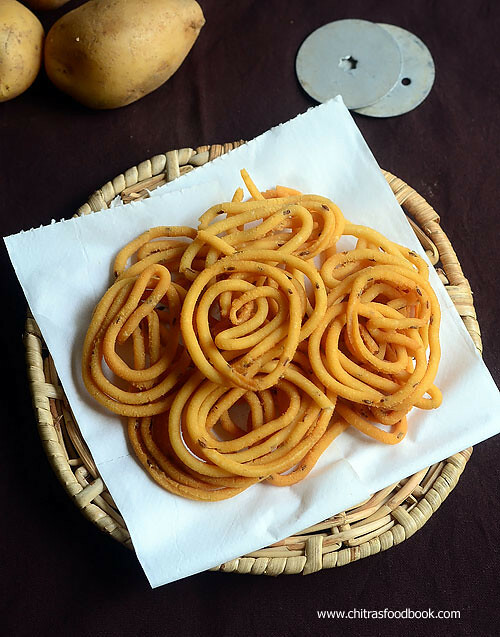 To begin with, I started my Diwali Snack/Savories recipes with this crispy, all time favorite potato murukku recipe ( Urulai kizhangu murukku) also known as Potato chakli/Aloo chakli in Hindi. I tried it last week by referring Sharmi’s passions. Actually I asked her for using ghee instead of butter but then I tried it with butter as per her recipe.It came out really well and crunchy. Raksha and Sendhil loved it a lot. Its very easy to make without using urad dal powder or fried gram powder.I have heard about Gulab jamun made with potato but murkku with potato is really a new thing to me. When I saw its results, I became very happy. Butter and potato does the magic in this recipe.Soon I will try this recipe with ghee and update the results.Now, Lets see how to make this simple and easy potato murukku recipe with step by step photos and a video ! 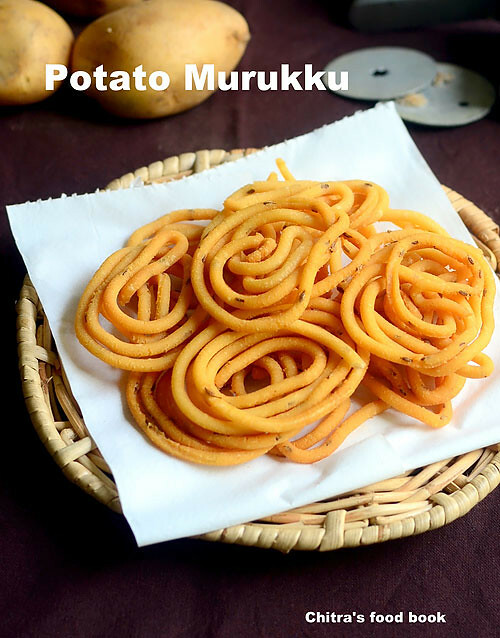 How to make easy potato murukku with rice flour, boiled potato and butter ! Wash and pressure cook potato. Peel the skin and grind it in a mixer adding 3 tbsp of water. Grind to a smooth paste. If the potato is very soft, it may take less water for grinding smooth.So add the water accordingly. But make sure potato becomes a smooth paste. In a wide bowl, take the rice flour, salt, cumin seeds, hing, mashed potato paste, melted butter. Mix everything well together. Add water little by little and make a smooth dough. No problem if the dough is slightly sticky but it should not be too hard and dry. So add water accordingly. Grease your hands and murukku mould/Chakli press with oil and put a small quantity of dough inside the mould. Use single hole mould. Star mould also works fine. Press the murukku on the back of ladle and keep it ready. If the string gets cut while pressing, sprinkle some water in the dough, mix well and again try it. Heat oil in a kadai to deep fry. Drop a pinch of dough to check the temperature of oil. If it rises immediately to the top without browning, oil temperature is just right. Now reduce the flame to medium and drop the murkku in oil. Deep fry 2-3 murukku at a time. Flip and cook both the sides till the bubbles in the oil cease. Remember oil should not be smoky at any point. so adjust the flame accordingly. This murukku won’t come out white in color. It looks light golden brown. After making 2-3 batches, check the oil temperature & make the remaining. The color of murukku may change as per the heat of oil. Store the murukku in an air tight box after it cools down. It stays good for a week.Enjoy ! Do not add more potato because you may get the smell of raw potato in the murukku. Do not reduce the quantity of butter. You can increase it to 2 tbsp for more crunchy and melt in mouth texture but never reduce it. I used white potatoes( Normal potato) in this recipe. I think Red coloured ( Mud potato) potato may give you white murukku. In my French fries & Potato chips recipes, I have used red colored potato which remain white. Please check out this link to see the color difference in potato. Do try this easy murukku at home and enjoy your teatime !! Nice recipe.. I'm gonna try soon.. Can you post kadamba chutney recipe? hi chitra murukku looks nice and crunchy. Looks super crispy and delicious!